NYCEAC has developed a number of programs to help professionals respond more efficiently and effectively to the needs of elder abuse and neglect victims. Click here for a pdf of our programs and services. Coordinating and facilitating two multidisciplinary teams – one in Manhattan (EMDT) and one in Brooklyn (BMDT). For information on presenting a case to either of these MDTs for expert review and recommendations, click here. Evaluating a Brooklyn-based multidisciplinary team. Providing clinical case consultations to Manhattan and Brooklyn professionals seeking to detect, assess and assist elder abuse victims. Engaging key leaders and decision-makers in discussions about elder abuse and the needs of victims to improve responses and policies. Developing a Brooklyn-based network of medical and mental health providers interested in working with the NYCEAC to assist elder abuse victims. Providing medical and mental health professionals with educational opportunities to learn how to assess and assist elder abuse victims. The quilt on this page was created by Thelma Reaves, Ayden Senior Center, Ayden, NC. 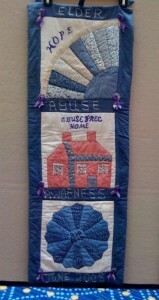 Click here for more information on the elder abuse prevention quilts available for display at conferences.